Opinion: The United States And Russia Aren't Allies. But Trump And Putin Are Monday's Trump-Putin summit was not a meeting between adversaries, writes Brookings Institution senior fellow Robert Kagan. It was a meeting between allies, with convergent interests and common goals. 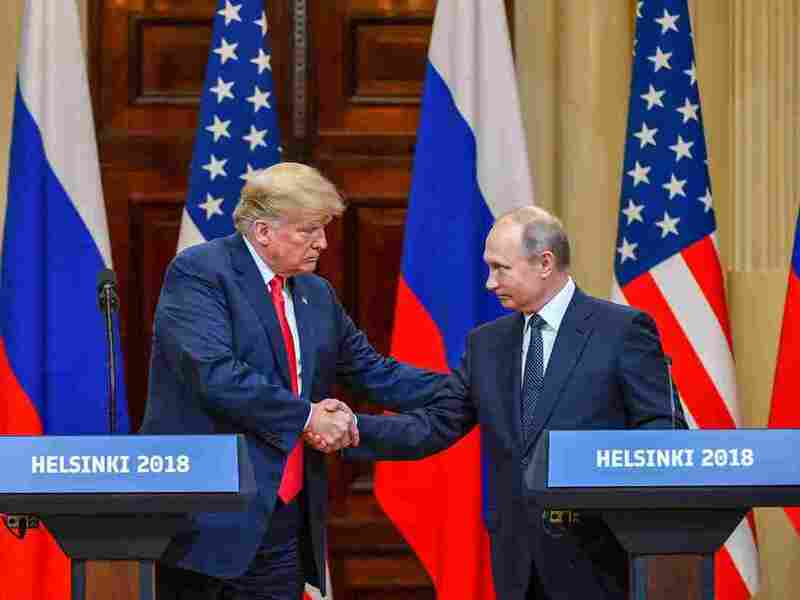 President Trump's and Russian President Vladimir Putin's summit was a meeting between allies, with convergent interests and common goals, according to a Brookings Institution fellow. Robert Kagan is a senior fellow at the Brookings Institution and the author of the forthcoming book The Jungle Grows Back: America and Our Imperiled World. Because it is hard to break old patterns of understanding the world, we have persistently misunderstood Donald Trump and what he is up to. Thus most observers of Monday's summit — critics and defenders alike — expected to see some version of the traditional meeting between American and Russian leaders: two adversaries coming together to address mutual concerns, raise objections, talk over possible solutions and seek common ground. There was the standard list of issues — Syria, Ukraine, nuclear weapons — on which to make progress or not. There were the standard concerns: Would Trump give up too much, out of naiveté, or for other, more nefarious reasons? And there were the standard justifications: What's wrong with adversaries getting together to discuss their differences? Why not seek ways to lower tensions? What observers could not see, or refused to see, was that this was not a meeting between adversaries. It was a meeting between allies, with convergent interests and common goals. These, incidentally, have nothing to do with the 2016 election. They have to do with a common view of the liberal world order that the United States helped create seven decades ago. Both leaders seek its destruction. Putin's interests come as no surprise. He has regarded the U.S.-led liberal world order as Russia's greatest adversary his whole life. It contained and then undermined the Soviet Union — the breakup of which was the "greatest tragedy of the 20th century," as he once put it — and then deprived post-Soviet Russia of its sphere of influence in eastern and central Europe. The triumph of the liberal world order after 1989 left Russia a second-tier power with a weak economy and embarrassingly diminished international clout. Putin has therefore sought, just as other Russian leaders have in the past, to weaken, divide and demoralize the liberal world. He has supported right-wing nationalist parties throughout Europe. He has tried to weaken and undermine the European Union and NATO. And it is understandable why. When the West is strong and coherent, Russia has little room to maneuver. Only when the West is in disarray — as it was during the Napoleonic Wars, for instance, or during the 1930s and 1940s — can Russia be a major global power and fulfill dreams of empire going back to Peter the Great. Only then can Russian leaders like Putin deliver geopolitical victories to distract attention from domestic failures. Putin never had an interest in integrating Russia into the liberal world order, therefore, even though the average Russian would have benefited, at least materially. He depends on confrontation and chaos. And, as it happens, so does Trump. That has certainly been his strength in domestic politics, and he has transferred his domestic modus operandi to the world stage. His success at home came from stirring up populist, nationalist passions against what he and his supporters regarded as an entrenched cosmopolitan elite. It's hardly surprising that he would view the world through the same lens, that he would support populist, nationalist movements across Europe against the traditional parties that have upheld the liberal world order. It is not just the European Union that he regards as a hostile foe — it is all the institutions and arrangements of the liberal world to which past American presidents of both parties have paid their allegiance. He regards them both as constraints on his freedom of action and as inherently hostile to him and his followers — which they are. Therefore, he seeks to destroy them, as he made clear not only at the NATO summit but throughout his presidency. Like Putin, he has thrown his support to Hungary's Viktor Orban, as well as to the right nationalist parties of France, Italy, the United Kingdom and across Europe. Like Putin, he supported Brexit and sees it as a way of breaking the EU. Like Putin, he hates Angela Merkel and would prefer the triumph of right-wing parties in Germany. Many asked before this week's summit what Putin would ask of Trump. Afterward, they breathed a sigh of relief that Trump did not give anything away. And the two men actually worked hard to make this look like the kind of summit people were used to, a typical meeting of adversaries trying to work out their differences and not entirely succeeding. What they apparently failed to notice was that Trump had already given everything away. In Putin's eyes, Syria and Crimea are trivialities compared with the collapse of the liberal West. At the summit, Putin acknowledged that he wanted to see Trump elected in 2016. While Western commentators persist in believing he must be disappointed, the payoff has probably exceeded his wildest dreams.